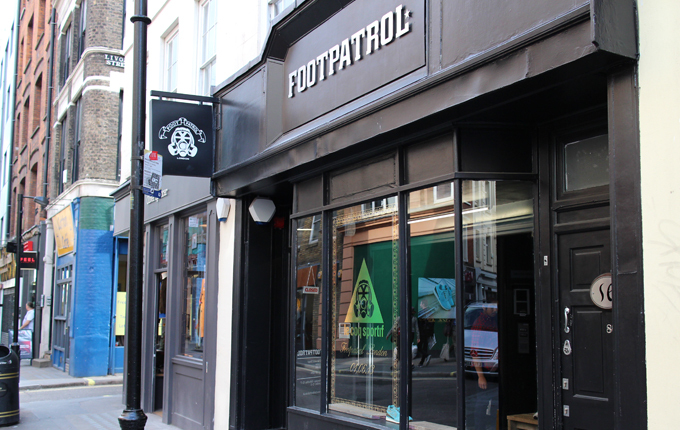 A veteran in the London sneaker scene, Foot Patrol was first established in 2002 but was absent for most of the latter half of the decade before returning in 2010 at a new Soho location. Behind the modest store front, a shack-like retail space encased in recycled wood boarding imitates the hidden boutiques of Tokyo, Japan and was designed by the same Wilson brothers who have since worked on both Supreme London and The Candy Store’s London locations. Holding the highest account status possible with a majority of the leading footwear brands you can expect to find the likes of Nike ‘Tier Zero’, adidas ‘Consortium’ and Converse ‘First String’ among the Foot Patrol roster as well as a hand-picked selections of men’s apparel, headwear and accessories. Picking up where they left off in 2006, the FP team have continued to make serious noise with their footwear collaborations also. Since the relaunch we have seen Special-Make-Ups of the Asics Gel Saga, Adidas Campus, Converse Pro-Leather and Reebok Workout to name a few, all co-signed and branded by the London retailer. The go-to place for limited edition footwear in the capital, if you’re visiting London to buy trainers and Foot Patrol isn’t the first name on your list, there’s something very wrong. Check the address below or alternatively wander around Soho before 10am on a Saturday morning and the line of sleeping shoppers should give the store’s whereabouts away.